Boiling Point Blog: Feminist, LGBT and progressive political cartoons: The kiss! Photo by Max Katler (my brother). Masheka and Mikhaela kiss after the ring exchange. That's cartoonist Ted Rall with Hello Kitty binder officiating. 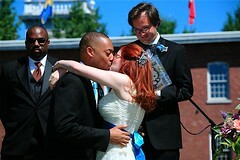 The ceremony was in Lowell, Mass, hence the mill building backdrop. Wow. That's some kiss. Mazel tov to you both, and I hope you have many happy years ahead of you. Awww! Not much tops Hello Kitty for sheer cute factor, but you managed it. Congrats again! OMG. So beautiful. I've been a long-time lurker/fan and just wanted to say CONGRATS! BIG BIG BIG CONGRATULATIONS TO THE BOTH OF YOU!!! Mazel tov on the union made. Always stay happy and always talk to each other. My late Uncle Stanley gave us the best advice after the wedding. His exact words, "Fuckalot" it has worked for the past 37 years.